Mexico City; April 16, 2018. 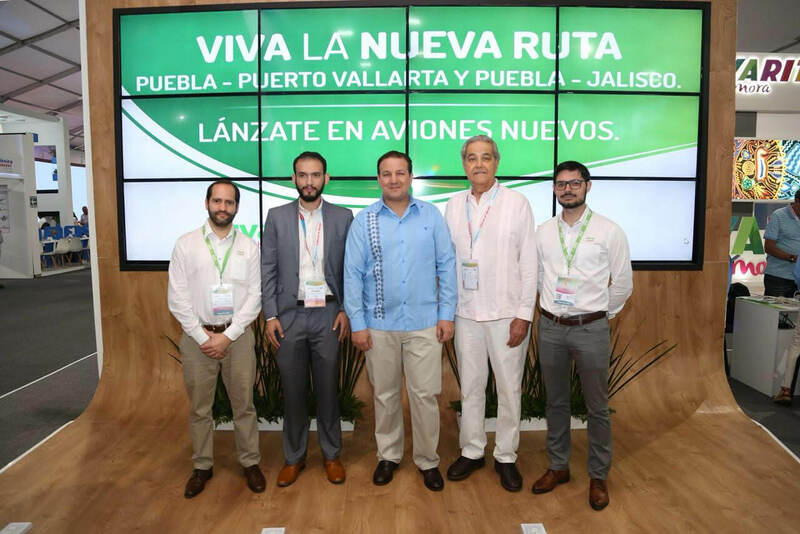 - As part of the efforts to strengthen tourism through a national air connectivity within the framework of the “Tianguis Turístico 2018”, Viva Aerobus, Mexico´s ultra-low cost airline, launched its new Puebla-Guadalajara route. The route will start operations in early September with three flights a week, on Monday, Wednesday and Friday with prices starting from $ 598 pesos. "We are proud that our firm commitment to a national expansion contributes to one of the objectives of this important event: to promote the diversification of the country's tourist destinations", said Rubén López, Director of Route Planning at Viva Aerobus. "We are distinguished by our unbeatable prices that build truly accessible bridges for more and more travelers, thus boosting the growth of the industry". Viva Aerobus will be the airline that will offer the largest number of seats to fly the Puebla-Guadalajara route, making available to passengers more than 58 thousand seats during the first 12 months of operation. Additionally, Viva Aerobus announced that, following the success of the PueblaPuerto Vallarta season route, it will be integrated into its regular offer at the beginning of July with 2 weekly flights: on Tuesday and Saturday. Viva Aerobus is the only airline offering this route and during the first year of operations it will offer more than 38 thousand seats at prices starting from $ 998 pesos. According to Jesús Enrique Ramos Flores, Secretary of Tourism of Jalisco, "this flight, now regular, undoubtedly represents a great opportunity for Jalisco to attract a segment of new tourism by connecting two destinations that are characterized by representative traditions and culture of our country. Puerto Vallarta is ready to receive passengers, who will be able to enjoy the most important beach destination in Jalisco and one of the most important in Mexico". Moreover, the Secretary of Culture and Tourism of Puebla, Roberto Trauwitz Echeguren, thanked the confidence of Viva Aerobus and pointed out that with the implementation of these routes, the state of Puebla strengthens its air connectivity, offering the citizens and visitors a wider offer at the Hermanos Serdán Airport. He mentioned that these flights are the result of the actions undertaken by the current administration in benefit of the consolidation of the state as a tourist and cultural destination; as well as the confidence of investors and entrepreneurs. Passengers can buy their tickets on Viva's official website: https://www.vivaaerobus.com/en, in VivaTiendas, calling the Call Center 0181 82 150 150 or at any point of sale of Grupo IAMSA such as on Omnibus de México, ETN, TAP, Primera Plus, Aers, TMT Caminante, La Línea and Autovías. Viva Aerobus is Mexico's low-cost airline. It started operations in 2006 and today operates the youngest Latin American fleet with 25 Airbus A320, including two A320neo on 90 routes and 36 different destinations. With a clear vision to give all people the opportunity to fly, Viva Aerobus has democratized the airline industry with the lowest rates in México and the lowest costs in Latin America, making their flights the best value offer.